Rockland Rowing recruits athletes from middle and high schools in Rockland, northern Bergen and Westchester counties. We welcome all athletes interested in the sport of rowing - whether your goals are to try something new, compete, or row in college. The goal of all youth programs is to offer a safe, fun and inclusive experience and continue our legacy of developing highly skilled and competitive rowers through training in the sport of rowing. Rowers begin with Learn to Row before progressing to the Development team and/or the Competitive team. We have four seasons winter, spring, summer and fall. The winter season involves indoor training on rowing machines, along with weights, cross-training and occasional use of rowing tanks. All other seasons are outdoors with practices held at Rockland Lake. Rowers can choose to row all year long or to pick those seasons that fit their schedules. Those rowers seeking to row in college will typically row most or all year long by their sophomore year in high school. For those just starting out, ages 12 and up. We have learn to row programs offered regularly throughout the year - they are incorporated directly into our Development Team practices. If you don't see what you're looking for, contact us as programs are always being added. GET STARTED. 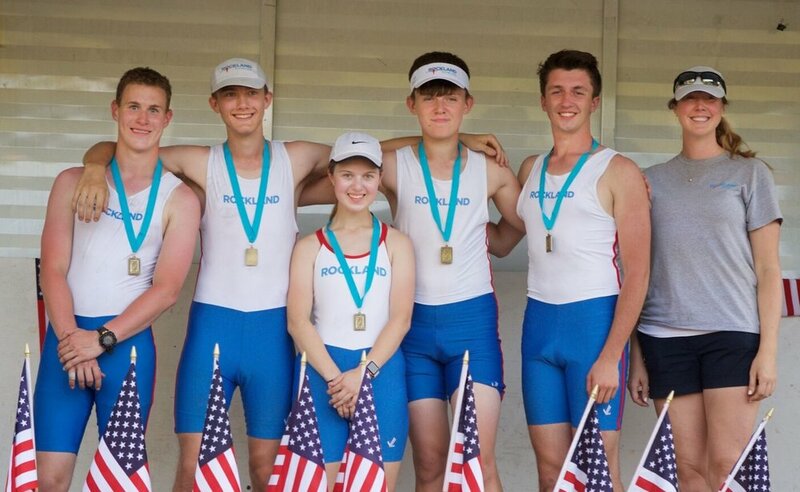 Typically for middle school athletes as well as older youth new to the sport and not quite ready for the competitive team, this program enables rowers to gain a strong foundation in all aspects of rowing. The focus is on long-term skill development and preparation for rowing at the high school level. Emphasis is on time spent on the water, rather than distance covered. Participants become part of a close-knit group of rowers that work together to improve their fitness, technique and racing skills while gaining a strong understanding of the work ethic and camaraderie that lies at the heart of the sport. GET STARTED. The competitive team is for high school athletes and caters to those wishing to compete in the sport and to row against other programs. The program provides a strong emphasis on all-around conditioning, improving technical skills on the water and conducting competitive training sessions where rowers sharpen their racing skills. Athletes who want more and are willing to give more are pushed harder. These athletes aspire for Youth Nationals qualification, college rowing recruitment and scholarships and/or the Under 19 U.S. National Team. In 2018 the team took silver at the 2018 Club National Championships, made the grand final at the Youth National Championships and won gold at the Mid-Atlantic Regional Championships. Most graduates of the high performance team have gone on to row for colleges around the country, including: Cornell, UCLA, University of Wisconsin, Tufts, University of North Carolina, Columbia, Boston College, USC, to name a few. The competitive team runs year-round and registration is by season. Each season has a slightly different focus to prepare for the difference in racing distances. Practices are typically two hours and meet five to six times per week. Competitions range from local regattas to regional and national championships. GET STARTED.